The Bendery Constitution by Hetman Pylyp Orlyk. May 3rd Constitution (painting by Jan Matejko, 1891). Polish King Stanisław August (left, in regal ermine-trimmed cloak), enters St. John's Cathedral, where Sejm deputies will swear to uphold the new Constitution; in background, Warsaw's Royal Castle, where the Constitution has just been adopted. Presidential copy of the Russian Constitution. ^ Pylee, M.V. (1997). India's Constitution. S. Chand & Co.. p. 3. ISBN 81-219-0403-X. ^ Sarkar, Siuli. Public Administration In India. PHI Learning Pvt. Ltd.. p. 363. ISBN 978-81-203-3979-8. http://books.google.com/books?id=smahlYxg-8YC&pg=PA363. ^ Kashyap, Subhash. Our Constitution-An introduction to India's Constitution and Constitution Law. National Book Trust, India. p. 3. ISBN 978-81-237-0734-1. ^ Gordon, Scott (1999). Controlling the State: Constitutionalism from Ancient Athens to Today. Harvard University Press. p. 4. ISBN 0-674-16987-5. ^ Watt. Muhammad at Medina and R. B. Serjeant "The Constitution of Medina." Islamic Quarterly 8 (1964) p.4. ^ R. B. Serjeant, The Sunnah Jami'ah, pacts with the Yathrib Jews, and the Tahrim of Yathrib: Analysis and translation of the documents comprised in the so-called "Constitution of Medina." Bulletin of the School of Oriental and African Studies, University of London, Vol. 41, No. 1. (1978), page 4. ^ Watt. Muhammad at Medina. pp. 227–228 Watt argues that the initial agreement was shortly after the hijra and the document was amended at a later date specifically after the battle of Badr (AH [anno hijra] 2, = AD 624). Serjeant argues that the constitution is in fact 8 different treaties which can be dated according to events as they transpired in Medina with the first treaty being written shortly after Muhammad's arrival. R. B. Serjeant. "The Sunnah Jâmi'ah, Pacts with the Yathrib Jews, and the Tahrîm of Yathrib: Analysis and Translation of the Documents Comprised in the so called 'Constitution of Medina'." in The Life of Muhammad: The Formation of the Classical Islamic World: Volume iv. Ed. Uri Rubin. Brookfield: Ashgate, 1998, p. 151 and see same article in BSOAS 41 (1978): 18 ff. See also Caetani. Annali dell'Islam, Volume I. Milano: Hoepli, 1905, p. 393. Julius Wellhausen. Skizzen und Vorabeiten, IV, Berlin: Reimer, 1889, p 82f who argue that the document is a single treaty agreed upon shortly after the hijra. Wellhausen argues that it belongs to the first year of Muhammad's residence in Medina, before the battle of Badr in 2/624. Wellhausen bases this judgement on three considerations; first Muhammad is very diffident about his own position, he accepts the Pagan tribes within the Umma, and maintains the Jewish clans as clients of the Ansars see Wellhausen, Excursus, p. 158. Even Moshe Gil a skeptic of Islamic history argues that it was written within 5 months of Muhammad's arrival in Medina. Moshe Gil. "The Constitution of Medina: A Reconsideration." Israel Oriental Studies 4 (1974): p. 45. ^ The Late Medieval Balkans: A Critical Survey from the Late Twelfth Century ... - John V. A. Fine, John Van Antwerp Fine - Google Böcker. Books.google.se. Retrieved on 2013-07-12. ^ Metasearch Search Engine. Search.com. Retrieved on 2013-07-12. ^ Dusanov Zakonik. Dusanov Zakonik. Retrieved on 2013-07-12. ^ Mangoné Naing, SAH/D(2006)563 The KURUKAN FUGA Charter: An example of an Endogenous Governance Mechanism for Conflict Prevention, Inter-generational Forum on Endogenous Governance in West Africa organised by Sahel and West Africa Club / OECD, Ouagadougou (Burkina Faso), 26 to 28 June 2006. pp. 71–82. ^ a b Tooker E (1990). “The United States Constitution and the Iroquois League”. In Clifton JA. The Invented Indian: cultural fictions and government policies. New Brunswick, N.J., U.S.A: Transaction Publishers. pp. 107–128. ISBN 1-56000-745-1. ^ Grinde, D (1992). “Iroquois political theory and the roots of American democracy”. In Lyons O. Exiled in the land of the free: democracy, Indian nations, and the U.S. Constitution. Santa Fe, N.M: Clear Light Publishers. ISBN 0-940666-15-4. ^ Bruce E. Johansen; Donald A. Grinde, Jr. (1991). metagame : native America and the evolution of democracy. [Los Angeles]: American Indian Studies Center, University of California, Los Angeles. ISBN 0-935626-35-2. ^ Armstrong, VI (1971). I Have Spoken: American History Through the Voices of the Indians. Swallow Press. p. 14. ISBN 0-8040-0530-3. ^ Shannon, TJ (2000). Indians and Colonists at the Crossroads of Empire: The Albany Congress of 1754. Ithaca: Cornell University Press. pp. 6–8. ISBN 0-8014-8818-4. ^ Jennings F (1988). Empire of fortune: crown, colonies, and tribes in the Seven Years War in America. New York: Norton. pp. 259n15. ISBN 0-393-30640-2. ^ Snow DR (1996). The Iroquois (The Peoples of America Series). Cambridge, MA: Blackwell Publishers. pp. 154. ISBN 1-55786-938-3. ^ Instrument of Government (England ) - Encyclopædia Britannica. Britannica.com. Retrieved on 2013-07-12. ^ Pylyp Orlyk Constitution, European commission for democracy through law (Venice Commission) The Constitutional Heritage of Europe. Montpellier, 22–23 November 1996. 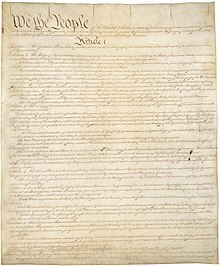 ^ constitution (politics and law) - Encyclopædia Britannica. Britannica.com. Retrieved on 2013-07-12. ^ Blaustein, Albert (January 1993). Constitutions of the World. Fred B. Rothman & Company. ISBN 978-0-8377-0362-6. http://books.google.com/?id=2xCMVAFyGi8C&pg=PA15&lpg=PA15&dq=May+second+constitution+1791. ^ Isaac Kramnick, Introduction, Madison, James (November 1987). The Federalist Papers. Penguin Classics. ISBN 0-14-044495-5. http://books.google.com/?id=WSzKOORzyQ4C&pg=PA13&lpg=PA13&dq=May+second+oldest+constitution. ^ "The first European country to follow the U.S. example was Poland in 1791." John Markoff, Waves of Democracy, 1996, ISBN 0-8039-9019-7, p. 121. ^ Payne, Stanley G. (1973). A History of Spain and Portugal: Eighteenth Century to Franco. 2. Madison: University of Wisconsin Press. pp. 432–433. ISBN 978-0-299-06270-5. http://libro.uca.edu/payne2/spainport2.htm. "The Spanish pattern of conspiracy and revolt by liberal army officers ... was emulated in both Portugal and Italy. In the wake of Riego's successful rebellion, the first and only pronunciamiento in Italian history was carried out by liberal officers in the kingdom of the Two Sicilies. The Spanish-style military conspiracy also helped to inspire the beginning of the Russian revolutionary movement with the revolt of the Decembrist army officers in 1825. Italian liberalism in 1820–1821 relied on junior officers and the provincial middle classes, essentially the same social base as in Spain. It even used a Hispanized political vocabulary, for it was led by giunte (juntas), appointed local capi politici (jefes políticos), used the terms of liberali and servili (emulating the Spanish word serviles applied to supporters of absolutism), and in the end talked of resisting by means of a guerrilla. For both Portuguese and Italian liberals of these years, the Spanish constitution of 1812 remained the standard document of reference." ^ Saul, John Ralston. The Doubter's Companion: A Dictionary of Aggressive Common Sense. Toronto: Penguin, 1995. ^ “Republic of Honduras: Political Constitution of 1982 through 2005 reforms; Article 374” (Spanish). Political Database of the Americas (Georgetown University). http://pdba.georgetown.edu/Constitutions/Honduras/hond05.html.